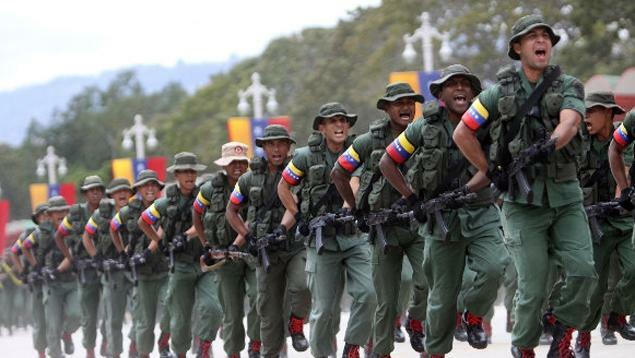 The latest senior military officer to defect from the Nicolas Maduro government claims that 90% of the armed forces are “unhappy” with Maduro and stand ready to defect, according to The Times. Colonel Rubén Paz Jimenez posted a short video to social media over the weekend declaring his support for US-backed opposition leader Juan Guaidó. “Ninety per cent of us in the armed forces are really unhappy,” he said in the video message. “We are being used to keep them in power.” He further urged soldiers to resist orders to block humanitarian aid shipped by the United States and to instead facilitate its entry into the country. A stockpile of US aid — medicines, medical equipment and nutritional supplements — is in the Colombian border city of Cucuta. Colonel Paz, a doctor, urged soldiers to help the aid get into Venezuela. Mr Guaidó has offered amnesty to those in the army who abandon Mr Maduro, 56, peacefully. He’s been further described as deputy of the Directorate of the Military Hospital in Maracaibo and the timing of his defection is interesting given the contested issue of US humanitarian aid. Trump administration officials like John Bolton have also of late actively encouraged Venezuelan military defections, something that so far has been limited to a tiny handful of officers, at least one of them an Air Force commander — while also attempting to force the issue of American aid delivery. Bolton recently invoked the “authorization” of Interim President Juan Guaido to ship humanitarian aid into the country including “medicine, surgical supplies, and nutritional supplements for the people of Venezuela” according to his statement. He urged Maduro “to get out of the way”. The Venezuelan pharmaceutical association has said that 80 per cent of medicines are in short supply. Most Venezuelans report involuntary weight loss over the past two years, and three million people — almost a tenth of the population — have left since 2014. The economy has collapsed and inflation is estimated at 2.7 million per cent. Meanwhile the socialist government in Caracas insists it isn’t experiencing a humanitarian crisis; instead Maduro has slammed US aid to the country as a “political show”. The United States urged the UN to act by presenting a draft resolution before the security council demanding that Venezuelan forces unblock the aid at the border, reportedly coming via Brazil and US ally Colombia, in order for the people to access it. Russia is expected to block the resolution. Interestingly, prior to this latest defection of military doctor Col. Paz, another high ranking officer had cited the exact same “90 percent” figure describing armed forces who are actually against Maduro. The highest ranking armed forces member to defect thus far, Air Force General Francisco Yanez, who was part of the air force’s high command, in his own video message early this month claimed a wave of defections is coming. The obvious question remains: is this a mere opposition propaganda talking point employed in the hopes of gaining momentum? Given the scant number of high level officers willing to abandon Maduro over the past two weeks as international pressure grows, it appears merely an empty scripted claim. But so far there’s been a tiny – we might even say insignificant – trickle as the country’s most powerful institution continues to stand by Maduro’s side against “foreign aggression” and the regime change rhetoric issuing from the White House. Previous Previous post: How About A Red, White, And Blue New Deal?